Traditional hydrocolloids include flour, cornstarch, and Wondra flour. As anyone who has ever used flour to thicken a stew before knows, you have to quick flour with oil into something called a roux before you can use it as a thickener. That's because flour can hydrate in both cold and hot water and can quickly form lumps. Wondra flour is essentially normal flour that has been pre-gelatinized: that is, it has already been hydrated, then that hydrated product is dried back into a powder. But, since the granules are already hydrated, it doesn't form lumps. In addition to these hydrocolloids, we also include with them any thickening products that are made from flour or other hydrocolloids, such as bread or tortillas. Another thickener you might not think you run into everyday but is as ubiquitous as, well, fruit, is the hydrocolloid pectin. Pectin is the naturally-occurring structure-giving hydrocolloid found in many fruits. 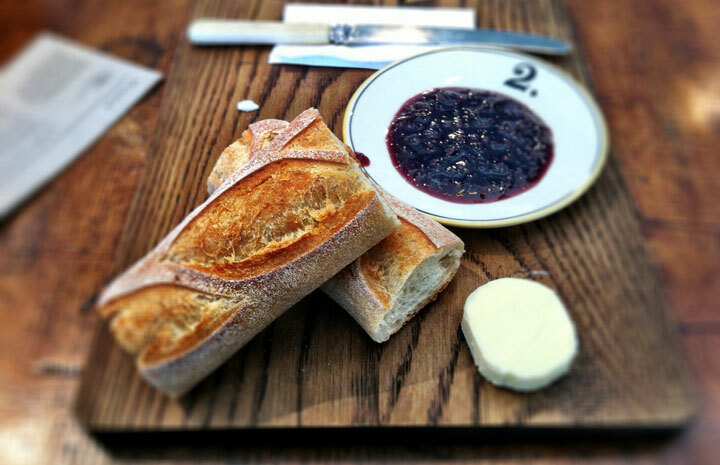 It is what gives jams and jellies their thickness. More importantly, though, anytime you blend fruit in a smoothie, it is the pectin that helps to make the smoothie creamy rather than lumpy and watery. You can purchase different types of pectin to amplify the thickening power of fruits. And finally, we'll take this opportunity to discuss liquids thickened with sugar. If you think that it's uncommon to thicken a sauce with sugar, remember that any reduction (for example, of wine or vinegar) is essentially thickened by the residual sugars left when water is boiled off. Sugar has a natural thickness, all the way to the point when all water is removed and the sugar becomes a solid. Glucose is even thicker than sucrose (table sugar) and is used in many baking applications. 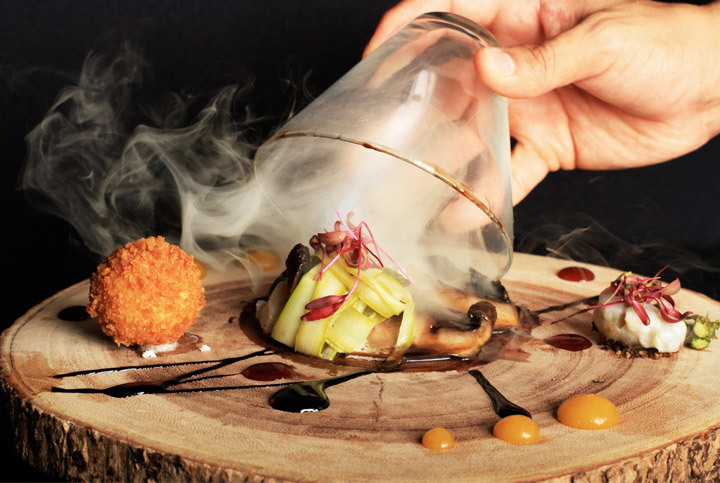 Note that in the below recipe for a Smokey Forest with lavender smoke, porcini soil, and an arugula sphere, Chef Tre Ghoshal calls for a simple reduction of balsamic vinegar to elegantly sauce this complex dish. Although he uses a thickener to create the reduction, the same effect could have been achieved traditionally by heating vinegar for a long time. But maybe this would result in a sauce that is too pungent. There are a wide variety of hydrocolloids that are commonly considered "modernist," even if they have been used for hundreds of years. 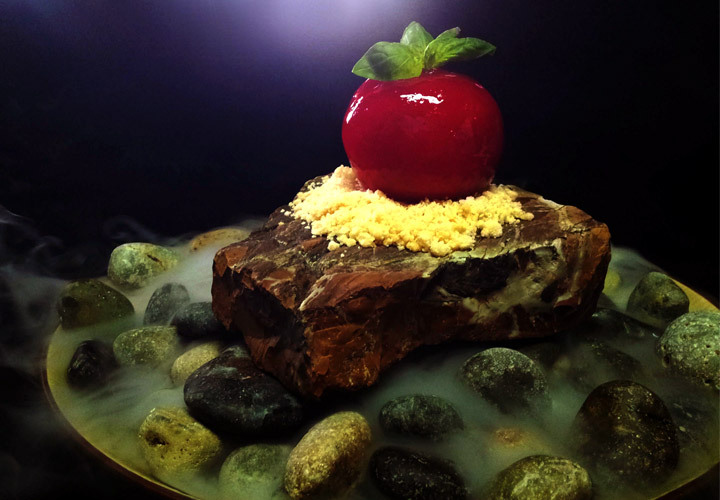 The application of technologies to haute cuisine is what usually defines a dish as modernist. Probably the most used and easiest-to-use hydrocolloid is xanthan gum. In addition, it is widely and cheaply available. Although xanthan can be used in traditional cooking to slightly thicken sauces, gravies, and stews, it really shines when used in combination with other hydrocolloids. 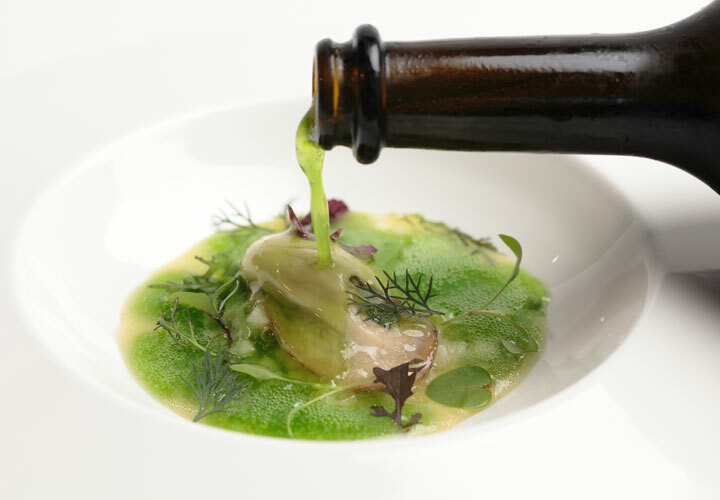 In the below recipe for Oyster with Parsley Champagne, xanthan gum is added to champagne to create a lightly-thickened sauce. In this recipe for Strawberry Ice Cream Cheesecake with Bell Pepper Jelly, xanthan gum is added to sour cream and cream cheese to give the cheesecake ice cream a slight thickness and bite. 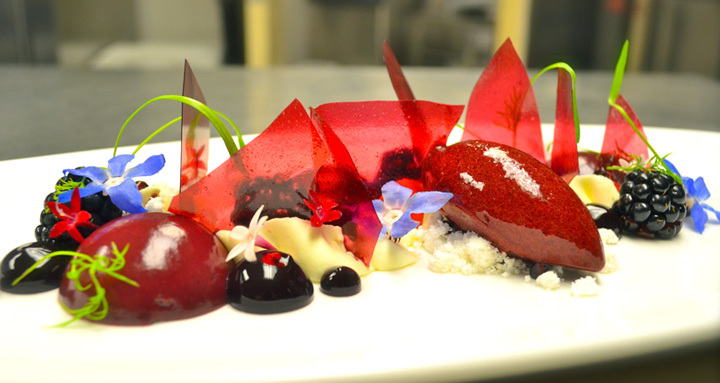 As we've mentioned above, many hydrocolloids used by molecular chefs have origins in a long culinary history. Kuzu root starch is extracted from the starch of the kuzu or kudzu plant in Japan. Agar agar is extracted from certain species of red algae and is commonly used in Asian cooking. Locust Bean Gum is derived from the starchy locust bean and has long been used in the Mediterranean to thicken foods. Modern processed versions of the gum have made its consistency more fine and its taste more neutral. 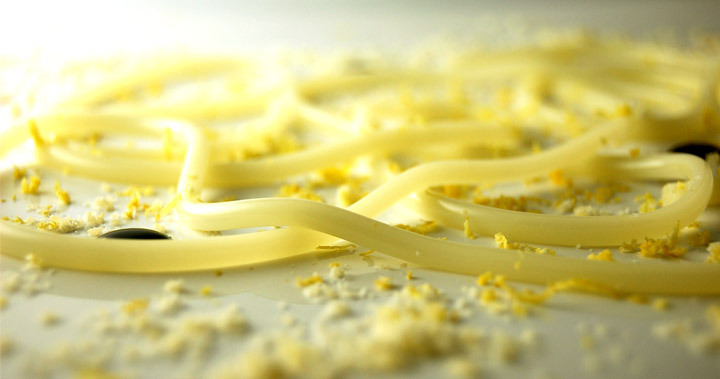 In this recipe for Parmesan Spaghetto by chef Ferran Adria and the El Bulli team, agar agar thickens and therefore transforms parmesan whey into a noodle that can be slurped and chewed just like any other pasta. 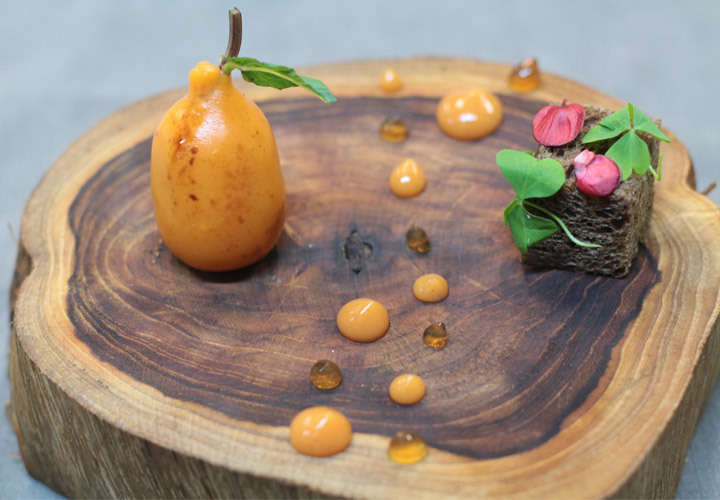 In this recipe for Foie Gras Medlar and Roasted Barley Bread, agar is combined with locust bean gum to make a thick, tangy gel. Not all thickeners have their roots in traditional cooking. In particular, the Ultra-Sperse and Ultra-Tex lines of products were specifically designed by the Natural Starch company as easy-to-use thickeners that would provide a consistent and ideal final texture. 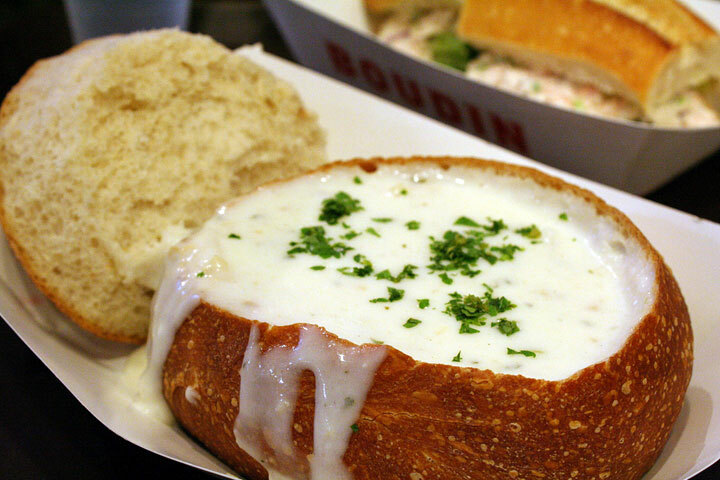 Think of it as xanthan, but with a better texture. In this recipe for Foie Gras Glogg, the luxurious wine sauce shown in the foreground is nothing more than spicy glogg and Ultra-Tex 3. One final note: any gelling agent can act as a thickener. By definition, gelling agents also thicken. Some gels can be blended to form fluid gels - a gel that behaves like a thickened liquid rather than a solid. 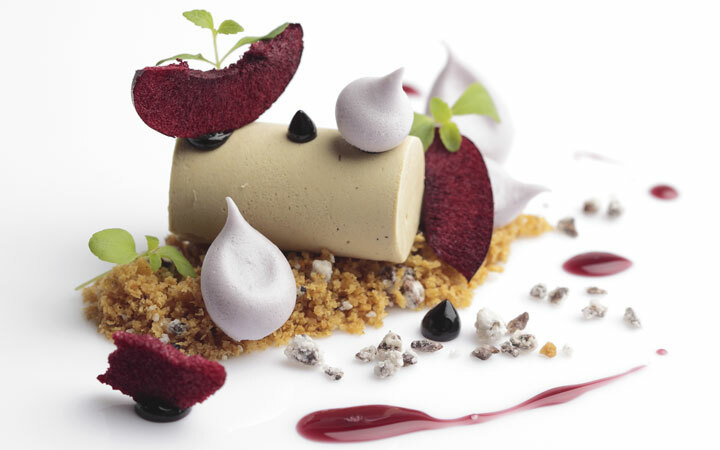 For example, in the below Blackberry in Textures dessert by chef Russell Karath, chef combines the gelling agent gellan with blackberry puree, then blends the resulting gel that can be shaped into a soft tuile.